You will all be knowing the importance of including fibre in your diet regularly. It helps to keep the digestive system healthy, prevents constipation helps to lower cholesterol levels, controls level of blood sugar and protect against some form of cancer. Plantain stem or vazhaithandu as it is called in tamil is a rich source of fibre. Here is a simple plantain stem recipe which can be served as a side dish for rice. Remove the outer covering of the stem and cut it into rounds removing the thread like fibres with you index finger .Then chop it into small thin pieces. Keep it in diluted buttermilk to prevent discolouration. Pressure cook tur dal with a pinch of turmeric powder till soft. 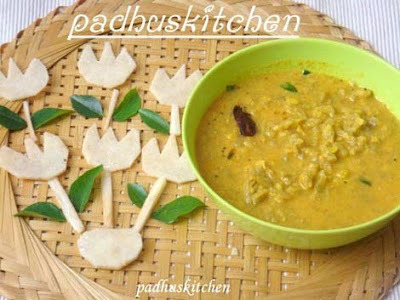 Fry urad dal and red chillies in a tsp of oil and grind it along with coconut and cumin seeds to a fine paste. Heat a tsp of oil in a pan and add the ingredients for seasoning. When mustard splutters , drain the buttermilk completely and add chopped plantain stem alone. Add turmeric powder, salt and cook till tender. Sprinkle water while cooking to prevent it from getting burnt. Add the grounded paste, cooked tur dal and bring it to boil . 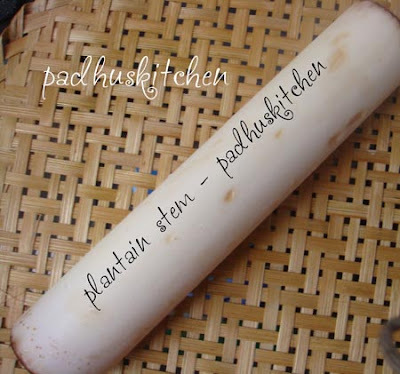 You can check out my Plantain stem Mor kootu /yogurt kootu which is also very tasty. Yum...this kootu sounds super tasty and delicious...loved the excellent clicks dear.. Yesterday only I cooked banana stem fry with the recipe from Shanti's blog (Iyengar cuisines). It was really great. Very nice click and presentation! we always make morkootu and curry out of this. This kootu with toor dal is new to me and sounds nice. Yumm yummy..I love plantain stem and curry looks soo tasty..
Yummy kootu ,looks tasty,i never prepared it but now i will prepare it .Thanku for sharing. Love plantain stem curry..this curry looks wonderful. Wow.. looks soo yum and delicious.. very beautiful presentation.. thanks for the awesome recipe dear !! I simply love vazhai thandu. I should check out in the Chinese markets. Good one !! One of my favorite vegetables.. we can't get it that much here...lovely..
Wow, lovely and great recipe. Something authentic which we don't get here. Never cooked plaintain stem this way. I cook it as a dry dish. Long time cooked it, will try this once. This we call as pindimiriyam. Only difference is we add few black pepper.